Jaeb and Tidepool have begun recruiting for an observational, virtual study of Loop, the do-it-yourself (DIY) automated insulin delivery app that runs on iPhone. The study will last at least 12 months, targeting 300-1,000 Loop users (adults and children) and collecting data on safety and efficacy. The study size estimate is higher than the “~150-300” range that Tidepool/Jaeb initially planned to recruit as of October. For context, Medtronic’s original MiniMed 670G approval was based on a three-month, single-arm study in 124 participants; this study of Loop will provide significantly more data in a real-world, more hands-off setting. Importantly, the FDA submission timing for Tidepool Loop is not necessarily the same as completing this 12-month study. Dr. Roy Beck reminded us that this study was funded by Helmsley Charitable Trust ($1.5 million) before Tidepool Loop was planned – it’s therefore possible that Tidepool could submit to FDA before all one-year of observational data are collected. While this study was a few months delayed from the original “November” plan, it’s great to see it starting on the early side of the revised “early 2019” plan. In ~26 hours of recruiting, an impressive 135 people had already filled out the study’s electronic consent form and as of “press time" was up to 189, including 18 “new users”. 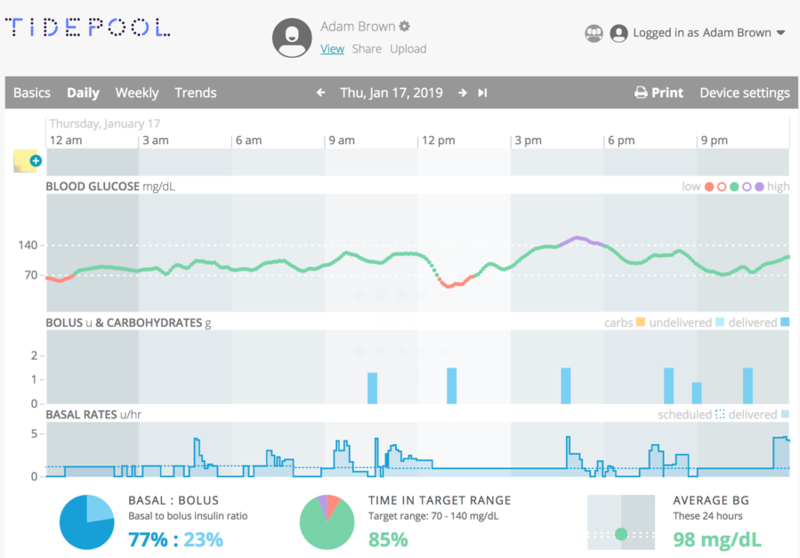 Adam characterized the process as “outstanding”, as the observational trial is totally virtual – CGM and pump data flow from the Loop app to Apple Health to Tidepool/Jaeb using the existing Tidepool Mobile app. (See Adam’s CGM/Loop data from yesterday below – no cables at all, all uploaded through the phone.) Fingerstick collection kits will be mailed to study participants to collect blood for A1c data at baseline, six, and 12 months. The study is using a Bio-Rad Hemoglobin Capillary Collection System, with laboratory analysis at the University of Minnesota. Surveys to collect other data (e.g., demographics, device use, quality of life, etc.) are done online. Notably, participants will receive an email and/or text from Jaeb to complete an ~one-minute survey each week – to report severe hypoglycemia, DKA, or a hospitalization in the prior week. This overall approach opens exciting doors for more virtual clinical trials in the future! Jaeb’s John Lum told us that the “biggest challenge” will be reaching the study goal to enroll 150 new Loop users. Obviously this will be a focus of FDA – ensuring people can safely get onto Loop, especially those who may not be early adopters. That said, the current DIY version of Loop is more complicated than the planned Tidepool Loop commercial version – e.g., old Medtronic pumps + RileyLink bridging device (now) vs. interoperable, Bluetooth-enabled pumps (Tidepool Loop). For more on Loop, see some of our team’s experience in diaTribe, including Adam’s Test Drive and Kelly’s Test Drive (fairly different experiences between the two), our Reflections 2018+2019 theme on AID interoperability, Tidepool’s original October announcement and subsequent $6 million in funding from the Helmsley Charitable Trust and JDRF, and Insulet signing on to integrate with Tidepool Loop. Per JPM, Dexcom is still evaluating whether to sign on, though this would be a great use of the iCGM indication. Participants will be compensated with a $50 electronic gift card at baseline (after completing questionnaires and the fingerstick for A1c), and then $50 after six and 12 months. A $50 gift card will also be provided for each virtual focus group that are also part of the observational study. At the end of six months and 12 months, participants will receive up to $60 for completing the weekly questionnaires.